Home > Articles >Why Are We In This Condition? Human being are constantly surrounded by trials and tribulations and they are ever increasing. Every knowledgeable person can confirm the fact that we are in the end of time and these trials will only escalate. The most essential goal at this time is to learn about what these trials are, and what we can do to save ourselves from falling into them. In the previous article titled “Tribulations are brewing; are you prepared to deal with them” we explored the concept of fitna—trials—from multiple angles. Here we will look into the social practices that invite the anger of Allah SWT in the form of tribulations as a punishment for our actions—for individuals, communities and societies. These actions are oppression, stinginess and negligence from enjoining the good and forbidding the evil. Let’s start with the most important and dangerous of these practices which is oppression or dhulm. Dictionaries define oppression to be the exercise of authority or power in a burdensome, cruel, or unjust manner. Islamic definition of the word dhulm or oppression is significantly deeper and consists of many levels. Simply speaking, Islam teaches us that oppression is the absence of justice. Anytime we fail to carry out justice—knowingly or unknowingly—we oppress someone. This oppression could be against one’s self, against other people, animals, or even environment. There is a very strong emphasis in both the Qur’an and the teachings of the Prophet Muhammad SAW on upholding the scale of justice. So how do we learn this justice? The answer is, through Qur’an, hadeeth and the sunnah of the Prophet SAW. The more we are aware of the book of Allah SWT and the life of His Prophet SAW, the more we can be just to ourselves and others. Today Muslim societies are bereft of justice and thus, by default, full of oppression and cruelty. Every facet of society has been twisted and instead of serving humanity, persecutes and subjugates them; and tragically—mostly in the name of Islam. Take example of zina or fornication in the Muslim world. When a young man commits the crime, almost everyone tries to find an excuse for his behavior claiming ‘he is a man’, and even tries to cover it up. However, if the same crime is committed by a woman, she is beaten, burned, mutilated or even killed—all in the name of honor and Islam! Men want to marry untouched virgins despite of what they might have done in their lives. Whereas any mistake of a girl, regardless of how repentant she might be, is inexcusable. Practice of dowry is another example of oppression in Muslim societies where ludicrous amount of money is expected of a man in order to marry the girl, or in some cultures from the parents of the girl as a gift for the man. How oppressive is it to deprive people of their youth and the joy of being in a pure relationship? Look at the amount of unmarried people well into their thirties and forties due to these ridiculous customs and what damaging effects these forms of oppression have caused in our societies! 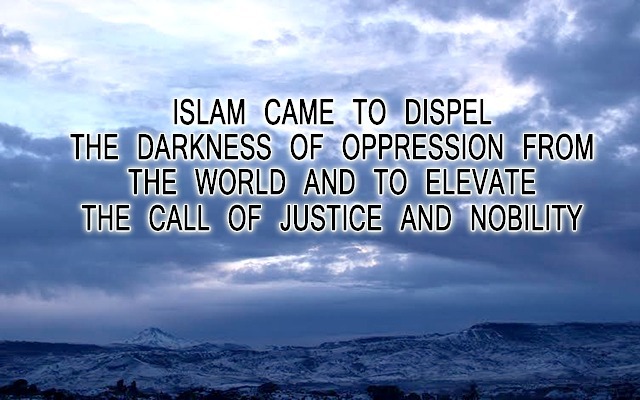 Islam came to dispel the darkness of oppression from the world and to elevate the call of justice and nobility. Justice lights the road to success, whereas oppression darkens the path and hinders any advancement. Cheating, lying, stealing, backbiting, bribery, prevalent custom of intercession instead of merit based achievements are just some of the many kinds of oppressions that are consuming our societies. They are not only hindering our worldly progress, they are eating away the moral fabric of our societies and lifting the mercy of Allah SWT from us. Why would Allah SWT send mercy over us when we don’t have mercy even for the weakest among us? 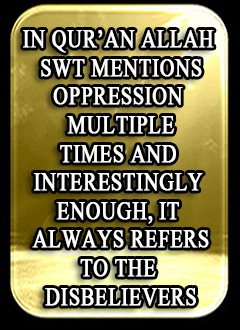 In Qur’an Allah SWT mentions oppression multiple times and interestingly enough, it always refers to the disbelievers. There is no mention of believers being oppressors because it is inconsistent with the very nature of being a believer. An oppressive believer is a paradoxical concept! This goes to show how detached we have become from our religion! From birth of children to access to education, from jobs to marriages and divorces, we refuse to follow Qur’an and sunnah of the Prophet SAW and insist on following cultures and customs that have no standing in Islam. And just look where this has brought us?! Islamic scholars have said that any person or nation which follows the practices of those whom Allah SWT mentioned in the Qur’an, will receive similar fate—good or bad. So if we follow the qualities of the disbelievers as mentioned in the Qur’an, we will not only taste the same punishments that they tasted, we will also receive the same title from Allah SWT. Every action that Prophet Muhammad SAW mentioned in the above narration is a form of oppression. How common are these acts today and how lightly they are taken! While the reality is that they can cause our destruction! This is what should scare any Muslim. Not only are we negligent of oppressing others, those of us who are more aware of our actions have no concern for the rest of the ummah! Even if we are not carrying out oppression ourselves, it is our religious and moral obligation to eradicate dhulm from the ummah. Our heedlessness is such that neither are we wary of committing oppression, nor about stopping it in our societies. If we are not busy rectifying the condition of the ummah and eradicating the oppression, we are just as guilty and are considered dhalim in front of Allah SWT! In this time and age, we are all dhalim at different levels and stages. May Allah SWT have mercy on us! Just look at the severity of warnings in these verses! Continue till the end of Surah Hud to get the complete message. 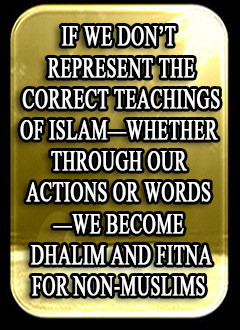 If we don’t represent the correct teachings of Islam—whether through our actions or words—we become dhalim and fitna for Non-Muslims. Ill manners, indecent actions, our neglect of inviting people to Islam are all forms of oppression against both Islam and Non-Muslims. One of the taba’ee (generation following the companions of the Prophet SAW) was imprisoned by the unjust ruler of his time. A pious lady from the locality brought him some food while he was in prison, which she sent with the guard. The taba’ee refused to eat from it and returned it as is. The lady was distraught thinking that he rejected her food assuming it was not halal. When he was released she complained to him about his behavior and he answered her saying that he refused the food not because he doubted her integrity or the purity of her food, but because it was carried by someone who worked for a dhalim and thus a dhalim himself! 3. We must embrace pure Islam! We follow culture and customs rather than the teachings of Allah and His Prophet SAW. We must make our utmost efforts to learn what Allah and His Prophet SAW want us to do in all aspects of our lives and then struggle to live accordingly. 4. Stand with the truth! A scholar explained this hadeeth to mean that if Muslims do not take this warning seriously and allow the oppression to continue in the society, then Allah will disgrace them. They will make du’a and Allah will not answer them. They will ask for rain but Allah will not send it; they will have drought. They will ask Allah for victory but He will not give it to them. Just look around at our condition today! Do we need any further explanation for why we are where we are today? Oppression is not only limited to withholding other’s rights, rather foul looks, negative talk such as backbiting or slandering, and evil thoughts are all forms of oppression against others. They cause the mercy of Allah SWT to be lifted and cause His wrath to descend. If Allah SWT didn’t even subject his enemy Fir’awn to this treatment and didn’t insult him in the Qur’an, then what gives us the right to behave the way we do? We are in the end of times and it is an era when people are distant from their own faith and the social ills are plenty; and this situation will get progressively worse. The more the oppression in our societies increases, the more the trials and tribulations from Allah SWT will increase. What we can do to save ourselves in front of Allah SWT is not to oppress others, try to stand with the truth and help the oppressed to the best of our abilities—even if just with the du’a. Stinginess is the second major social disease that incurs the wrath of Allah in the form of increased fitan (tribulations). The deen of Islam is complete. Allah SWT, with His ultimate mercy and wisdom, has informed us through the Qur’an and the sunnah of His Prophet SAW of the situations that we will encounter in this world, and how to deal with them. 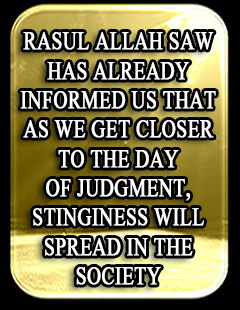 Stinginess is one of the diseases—personal and social—that we have been warned against by Allah SWT and His Prophet SAW. Scholars said that two traits are not combined in a believer: Stinginess and bad manners. Ease of the hand (spending) is directly related to the ease of the heart! When the heart is softened with the constant remembrance of Allah SWT and the awareness of the transient nature of this world, spending in the way of Allah comes naturally and with ease. Stinginess is one of the diseases of the heart that not only constrain the life of the stingy person but spread corruption, injustice and discord in the society. This wrong in the society becomes a cause of inviting trials and tribulations from Allah SWT. Today, we are not only stingy to others; we are stingy to our own selves. We are stingy to our souls by not spending time and money in the way of Allah SWT, which in the end is for our own benefit. If we are generous to ourselves and spend what it takes to develop a strong relationship with Allah SWT, He will be for us and change conditions in our favor. The old lady didn’t go anywhere seeking help. She turned to the Most Powerful One who is able to put all affairs in order. Her belief in Allah got her the help and victory she needed and saved her the humiliation of begging from others. This belief takes time and effort to develop which requires a person to be generous to himself. Stinginess is a disease of the heart which destroys a person in this life and the hereafter. A stingy person is greedy, selfish, is only concerned with his own accumulation of wealth. He neglects the society and his moral and ethical duty towards others. Every wealthy person is the custodian of his money and he is responsible to spend it for sabeeillah, and take care of the needs and affairs of the society. When they deprive themselves of that, they become worthless people in front of Allah SWT who cause humiliation to themselves in this life and the next. Their stinginess has far reaching consequences—for them and the society. They will be disgraced and tortured due to it in the next life; and in this life their stinginess contributes to spreading mischief, poverty, hardship and oppression. Thus, it is a disease that trickles down to all facets of society and distorts it to the point it can lead to massive bloodshed and wars. May Allah SWT protect us from the stinginess of our own souls and count us among the successful ones. Ameen. The third social practice that causes fitan to increase in the society is Muslims’ negligence towards enjoining good and forbidding evil. Enjoining the good and forbidding the evil—amr bil ma’roof wa nahi anil munkar— is the responsibility of every Muslim. Enjoining good and forbidding evil is a duty of every Muslim and negligence from it brings severe consequences from Allah SWT. This can be clearly seen from the verses we just read as well the sayings of the Prophet SAW mentioned below. "The first defect (in religion) which affected the Children of Israel in the way that man would meet another and say to him: 'Fear Allah and abstain from what you are doing, for this is not lawful for you.' Then he would meet him the next day and find no change in him, but this would not prevent him from eating with him, drinking with him and sitting in his assemblies. When it came to this, Allah led their hearts into evil ways on account of their association with others." Then he SAW recited, "Those among the Children of Israel who disbelieved were cursed by the tongue of Dawud (David) and 'Isa (Jesus), son of Maryam (Mary). That was because they disobeyed (Allah and the Messengers) and were ever transgressing beyond bounds. They used not to forbid one another from the Munkar (wrong, evildoing, sins, polytheism, disbelief) which they committed. Vile indeed was what they used to do. Look at the amount of warnings in these ahadeeth! Allah SWT cursed Bani Israel because they were sinners and didn’t engage in advising each other. Allah SWT cursed them! Do we even realize the severity of this word? Reminder: Scholars have said that any nation that repeats the actions that brought the punishment or curse of Allah, will receive the same. This places an immense responsibility on the shoulders of every Muslim and becomes a duty for every one of us to be an ambassador of Islam to humanity. As long as we uphold this responsibility with seriousness, Allah SWT will be on our side but the moment we forget it, the support of Allah SWT will be lifted. The first step is to embody the teachings of Islam in our lives. Only then can we receive the blessings from Allah SWT and be able to effectively spread them. This hadeeth should be taken as an eye-opener and a warning. If we do not worry about what is going on in the ummah sooner or later we will all suffer the consequences. We are all in the same boat as an ummah, regardless of where we may be. We are beginning to see the effects of our negligence towards the ummah. Problems like bribery, oppression, crimes, alcohol and drugs, discrimination, racism are some of the issues that spread in the society when we—Muslims—forget our duty of enjoining good and forbidding evil. When the educated people from Bani Israel turned a blind eye from the evils in their society and adopted the attitude of ‘what is advice going to do’, Allah SWT sent His torture. If we do the same, the torture of Allah SWT will come. Torture of Allah SWT takes many forms and shapes. It doesn’t have to be in the form of earthquakes or tornadoes. Absence of iman, inability to be tranquil and happy, lack of contentment, being unaware of the purpose of our existence, blindness from seeing the truth and following it, disunity and lack of harmony among the families, inability to perform good deeds and spend in the way of Allah are all forms of torture from Allah SWT. They lead us to spend aimless lives until we become witness against our own souls on the Day of Judgment. Our world is in turmoil with one tribulation following another. These tribulations are sorting believers from disbelievers and hypocrites; each becoming clear by the choices they make when faced with the trials. Many people lose their faith when faced with severe trials; isn’t that a form of torture? If Allah gives this ummah a more severe test, many will leave Islam. This is how weak we are! Note: Throughout last sixty or seventy years, many Muslim lands have been under oppression and aggression. A lot of Muslims from these lands migrated to the Western countries and settled there. When these people left their homelands they were in desperate need of basic necessities of life. Today, if we go back to these same people who migrated during the times of turmoil and see what happened to them, we will understand the concept of torture from a different dimension. Allah SWT opened for them the duniya until they became content with it and got involved in the championship of accumulating material life. Now they are well established business people, very successful in life, some of them are millionaires or even billionaires. But if you look at their lives, majority of them have already lost their deen; either they left Islam or they live only with a Muslim name and there is no Islam in their lives. When these people die, what will they take with them? Is this not a form of torture when Allah makes you heedless from the hereafter? This is actually the ultimate torture! Have you heard about someone who got a stroke or heart attack when he lost his business or savings? What about a parent becoming paralyzed upon losing a child? It happens when the reality of life is muddled in our hearts. When instead of realizing that every blessing in this life is a trust from Allah and we don’t own anything, we become obsessed with what we have been given. Allah is the One who gives and takes, at the time He wants and in the way He wants. When we become occupied with petty mundane things in life instead of worrying about good deeds that can earn us the pleasure of Allah and victory from Him, the torture of Allah SWT has to come. Some scholars deduce from this hadeeth that fighting oppressive rulers in Muslim countries is not allowed. The real fight today is to go back to Allah SWT, reject culture and customs, accept pure teachings of Islam and carry out amr bil ma’roof wa nahi anil munkar among each other until we change. Once we change, Allah SWT will change the condition around us in our favor. Any Muslim group that tries to get into politics and control the government will never be successful! Just look around and see what happened every time an Islamic group went into government. Who fought them? Their own people! 1. They tried to jump the sunnah of Allah SWT and tried to govern without spreading the d’awah first. 2. Since the d’awah didn’t take place, people were not ready to accept religious looking leaders, let alone implement the laws of Allah SWT. 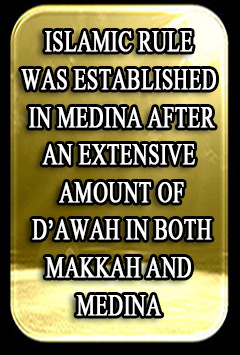 Islamic rule was established in Medina after an extensive amount of d’awah in both Makkah and Medina. Shari’ah is given to us from Allah if we deserve it. Therefore, instead of running after Shari’ah, we need to focus on fixing ourselves and our surroundings until we are deserving of Shari’ah. Over the last two hundred years many Muslim groups have emerged on the world stage. Each of these groups claim to be firqa najia—the one! We have seen group after group trying to implement Shari’ah in Muslim countries and they have failed terribly. How many people are ready to implement Shari’ah in any Muslim country? The number is very little; and even those few who want it, do not know how to do it. 3. They do not have proper adab (manners and character), humbleness and humility. They develop arrogance and tend to fall into arguments. 4. They will always have division among themselves. This is because they were never trained to control their hawa (desires) and when something against their will happens, instead of uniting with each other, they split. They divide instead of uniting because they lack proper learned leaders. A lot of Muslim groups take the following hadeeth of Rasul Allah SAW and claim that they must do something with their hands. They do not follow the correct sequence. Just look at the term amr bil ma’roof wa nahi anil munkar. If we do ma’roof, it automatically gets rid of the munkar. When there is justice in the society, a lot of above mentioned social problems will automatically be eradicated. So instead of complaining about others’ munkar, if we encourage them to do ma’roof, it will erase their munkar. When people are conscious of Allah SWT and aware of the accountability of their actions, they will refrain from committing evil. So the best way of enjoining good is to bring people nearer to Allah SWT and by planting the seed of iman in their hearts. This is not the time of talking and labeling. We have to do whatever we can to establish the basic values of Islam in our lives and our surroundings. It is a time of fitna and the situation will only get worse. In times like these we need to go to Allah SWT, who will lead us and guide us to what will save us. Regularly put aside some money for the sake of Allah SWT and good deeds, even if we do not know what to do with it. This practice will bring the blessings of Allah and He will eventually guide us to where to use it. Designate regular time to do dhikr and cry to Allah to open for us and show us what to do. Why will Allah SWT open and change condition unless we make an effort between us and Him? It is time to stop talking and start working! May Allah SWT guide us to what is beloved to Him SWT. Ameen.